Manawatu Mustangs coach Matthew Cole was ruing a second-half meltdown that cost them against the Taranaki Sharks. The Mustangs had led Taranaki 14-4 at halftime in their national championships qualifying match at New Plymouth on Saturday, only to have a mistake-ridden second half and allow Taranaki to come back to win 26-22. "We just shot ourselves in the foot," Cole said. "[Taranaki] were there for the beating." Manawatu had a try disallowed in each half which didn't help. They were still a chance to win the game at the end when centre Nikolao Ioane scored to make it 26-22 with three minutes remaining and then Manawatu were on attack 20 metres out, they knocked the ball on from the scrum. Thanks to their forwards, Manawatu were dominating up the middle, but their completion rate let them down. Cole said Taranaki weren't even in the game at halftime. "We were making massive yards, but after the third tackle we'd try and spread it wide and they would drop it or it wouldn't go to hand. It just killed us. "We couldn't complete a full set of six. Whenever we got into their half we scored." It was similar to last week's pre-season game against Te Atiawa when Manawatu kept making mistakes. Props Wesley Veikoso and Pita Marshall both had big games, making massive a lot of powerful carries. Taylor Haimona, usually a five eighth, was shifted to lock and had a great game on defence, while second rower Johnny Kerrisk was strong too. Taranaki scored five tries to Manawatu's three, but the accurate boot of goal kicker Haimona kept them in the game. Manawatu will now need to topple Wellington in Wellington next weekend if they want any chance of qualifying for the next round of the national championship. Cole said he may make a few changes for the game. Manawatu lost winger Neihana Johnson in the first five minutes with a knee injury, so forward Takarua Pou replaced him. 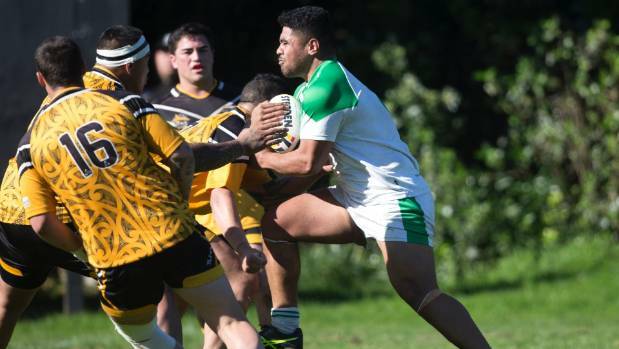 Taranaki Sharks 26 (Jaron Schischka, Ren McGee, Enele Fidow, Tyler McCarthy, Whai Hohaia, tries; Mark Davis 2 con, Fidow con) Manawatu Mustangs 22 (Taylor Haimona, Awatere Kiwara, Nikolao Ioane, tries; Haimona 3 con, 2 pen). HT: 4-14.